One is actually one of my all time favorite tracks by Metallica. I just love the aggressiveness of this song. The combination of the nice riffs by James plus the amazing solo of Kirk and Lars double peds is just too damn good, eargasmic! This song really defies the old school thrash metal genre! Plus Metallica is one of the best metal bands of all time. 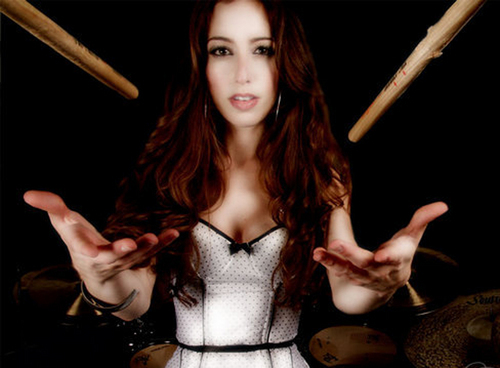 Meytal Cohen, one of the best drummer girl I have ever seen, made a cover for this song. She is just an amazing drummer, in my opinion. She has a lot of passion and skill, which can be seen in her videos. Plus she is a gorgeous rocker type chick! Just amazingly hot! You can click the link of her Drum Cover after the cut! You might as well subscribe in her channel as she really has lots of amazing drum covers! Her channel is good, and she releases a new video every Saturday. Aside from the drum covers, she also has drum tutorial/tips. Those videos can really help amateur drummers. So what are you waiting for? Just sit back relax, watch the video and enjoy the awesomeness! Had spent tons of hours just watching her covers!